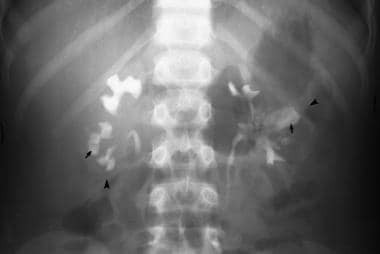 In reflux nephropathy, Hodson initially noted the association of vesicoureteral reflux (VUR) with renal parenchymal scarring. Such scarring is demonstrated in the images below. 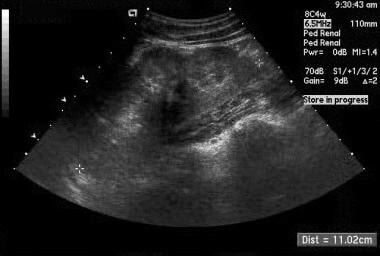 Sonogram in a child with recurrent urinary tract infections and vesicoureteral reflux. Focal contour indentation along the lower lateral margin of the left kidney (longitudinal view) reflects a focal pyelonephritic scar, which is an appearance distinct from the more global parenchymal scarring seen in the next image. Longitudinal sonogram of the left kidney in an 18-year-old woman with a history of recurrent urinary tract infections demonstrates normal parenchymal thickness in the upper portion of the kidney and generalized marked parenchymal thinning in the lower portion. The latter reflects chronic pyelonephritic scarring secondary to urinary tract infection and vesicoureteral reflux that occurred in childhood. Renal ultrasonography (RUS) and voiding cystourethrography (VCUG) are the preferred radiologic examination methods. [1, 2, 3] The 2 procedures provide complementary information. RUS helps in evaluating the upper urinary tract (kidneys and proximal portion of the collecting system) for anomalies, masses, calcification, hydronephrosis, and size and can identify renal scarring if moderate to severe in degree. VCUG helps in evaluating for VUR and the anatomy of the lower urinary tract (bladder and urethra). Nuclear medicine renal scanning with a cortical imaging agent (eg, technetium-99m [99m Tc] dimercaptosuccinic acid) is a better means of detecting and identifying renal scarring than is ultrasonography. Imaging with renal scanning may require sedation in younger children. Sedation is increasingly requested, although rarely necessary, for children undergoing VCUG. Computed tomography (CT) scanning is not indicated in the evaluation of reflux nephropathy because of radiation dose, the need for intravenously administered contrast material, and the potential need for patient sedation. Although CT scans can demonstrate renal scarring and hydronephrosis, they cannot demonstrate VUR. Plain images offer no diagnostic information regarding vesicoureteral reflux (VUR) and reflux nephropathy, although they can be used to evaluate spinal anomalies and potential urinary tract calculi, which rarely occur in this population. VCUG is essential in evaluating lower urinary tract anatomy and in identifying or excluding VUR. With voiding cystourethrography, contrast material is instilled in the urinary bladder via a transurethral catheter and demonstrates increased opacity in the ureters and pelvicaliceal systems when VUR is present. VUR grading (grades 0-5) is based on the distribution and degree of associated upper urinary tract dilatation demonstrated on VCUG. A 15-minute postinjection anteroposterior view of the kidneys in a 9-year-old boy with a history of multiple urinary tract infections who presented with hypertension demonstrates bilateral diffuse calyceal clubbing (arrows) and deformity accompanied by thinning of the adjacent renal parenchyma (arrowheads). These findings reflect chronic pyelonephritis and demonstrate the characteristic appearance of reflux nephropathy on intravenous urography. False findings occur infrequently; however, the soft tissue of the bowel wall can simulate contrast enhancement in a ureter, and overlying stool and intestinal gas can sufficiently obscure the kidney to prevent identification of lesser degrees of VUR. Scarring from reflux nephropathy can usually be differentiated from scarring from other etiologies (such as parenchymal infarction) by the fact the calyx underlying the scar will be deformed in reflux nephropathy. Echo-enhanced cystosonography performed by using ultrasonographic contrast media is a new diagnostic procedure with a major attribute in the exclusion of ionizing radiation. With ultrasonography, the degree of confidence is moderate in the detection of reflux nephropathy. 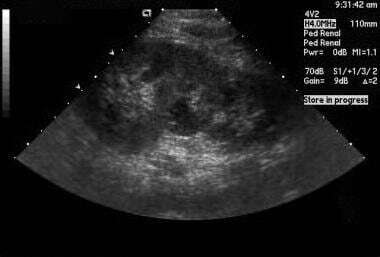 Lesser degrees of renal scarring may not be evident with ultrasonography. Echo-enhanced cystosonography, in limited experience, is reported to be as accurate as radiographic VCU in the identification of reflux. Fetal lobation and other normal variants of renal development may be mistaken for renal scarring on ultrasonograms. Technetium-99m dimercaptosuccinic acid and 99mTc glucoheptonate are scintigraphic agents with a high affinity for the renal cortex (as demonstrated in the image below), because they are concentrated by renal tubular cells. [11, 12] As a result, they produce a relatively high level of renal detail. Concern for acute pyelonephritis, the assessment of renal cortical scarring, and the identification of a malpositioned kidney are among the indications for cortical scintigraphy. The use of single-photon emission CT (SPECT) scanning increases the sensitivity of the agents to changes of renal scarring and acute pyelonephritis. 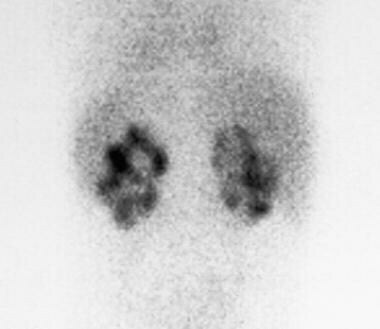 Renal scan by using the cortical imaging agent technetium-99m dimercaptosuccinic acid in a 2-year-old boy with a history of multiple urinary tract infections demonstrates diffuse bilateral renal scarring, which is indicated by the multifocal areas of absence of renal cortical isotope accumulation. Reduced accumulation of a cortical imaging isotope within the renal margins is an indication of renal scarring. Radionuclide cystogram provides an alternative to VCUG in identifying renal scarring. Cystograms have the primary disadvantage of poor anatomic resolution but the advantage of a lower radiation dose. The degree of confidence is high with renal cortical imaging performed with 99mTc dimercaptosuccinic acid. Patient motion, structural abnormalities of the kidneys, and unsatisfactory isotope administration may result in false-positive and false-negative findings. Patient motion results in inaccurate imaging depiction of isotope distribution and greater probability of underestimating renal scarring (false-negative findings). Hydronephrosis, anomalies such as ectopic and/or fused kidneys, and renal masses or cysts may result in the overestimation of severity of renal scarring (false-positive findings). Montini G, Zucchetta P, Tomasi L, et al. Value of imaging studies after a first febrile urinary tract infection in young children: data from Italian renal infection study 1. Pediatrics. 2009 Feb. 123(2):e239-46. [Medline]. [Full Text]. Sorkhi H, Nooreddini HG, Amiri M, Osia S, Farhadi-Niakee S. Prediction of vesicoureteral reflux in children with first urinary tract infection by dimercaptosuccinic Acid and ultrasonography. Iran J Pediatr. 2012 Mar. 22(1):57-62. [Medline]. [Full Text]. Canning DA. Re: the prognostic impact of an abnormal initial renal ultrasound on early reflux resolution. J Urol. 2013 Feb. 189(2):694. [Medline]. McMahon LP, Katsoulis J, Troupis JM, Barit D, Delecheneau P. Use of magnetic resonance imaging to assess renal structure and function in reflux nephropathy. Nephrology (Carlton). 2007 Apr. 12(2):172-7. [Medline]. Lin CH, Yang LY, Wamg HH, Chang JW, Shen MC, Tang RB. Evaluation of imaging studies for vesicoureteral reflux in infants with first urinary tract infection. Acta Paediatr Taiwan. 2007 Mar-Apr. 48(2):68-72. [Medline]. Darge K. Voiding urosonography with US contrast agents for the diagnosis of vesicoureteric reflux in children : II. Comparison with radiological examinations. Pediatr Radiol. 2007 Jul 18. [Medline]. Wong IY, Copp HL, Clark CJ, Wu HY, Shortliffe LD. Quantitative ultrasound renal parenchymal area correlates with renal volume and identifies reflux nephropathy. J Urol. 2009 Oct. 182(4 Suppl):1683-7. [Medline]. Müller L, Preda I, Jacobsson B, Sixt R, Jodal U, Hansson S, et al. Ultrasonography as predictor of permanent renal damage in infants with urinary tract infection. Acta Paediatr. 2009 Jul. 98(7):1156-61. [Medline]. Kovanlikaya A, Kazam J, Dunning A, Poppas D, Johnson V, Medina C, et al. The role of ultrasonography in predicting vesicoureteral reflux. Urology. 2014 Nov. 84 (5):1205-10. [Medline]. Park YW, Kim MJ, Han SW, Kim DW, Lee MJ. Meaning of ureter dilatation during ultrasonography in infants for evaluating vesicoureteral reflux. Eur J Radiol. 2015 Feb. 84 (2):307-11. [Medline]. Ziessman HA, Majd M. Importance of methodology on (99m)technetium dimercapto-succinic acid scintigraphic image quality: imaging pilot study for RIVUR (Randomized Intervention for Children With Vesicoureteral Reflux) multicenter investigation. J Urol. 2009 Jul. 182(1):272-9. [Medline]. Luk WH, Woo YH, Au-Yeung AW, Chan JC. Imaging in pediatric urinary tract infection: a 9-year local experience. AJR Am J Roentgenol. 2009 May. 192(5):1253-60. [Medline]. Anteroposterior digital view during voiding cystoureterography of the upper bladder to the kidneys demonstrates bilateral grade 5 vesicoureteral reflux, with severe dilatation of both ureters, the renal pelves, and the bilateral calyces.